By providing a means to submit cases, make payments, reprint invoices and statements, or simply send your lab a message 24 hours a day, the Customer Portal can enhance the level of support you provide your customers. Unlike other practive management services Every action the customer performs in the portal is tracked and stored in the same database and with alerts your team can be notified instantly. Ever wish for a safe and secure way for your doctors to let you know about a prospective case before they send in the Rx and case materials? Ever wish your doctors could verify the status of a case without ever picking up the phone? Or how about submit a picture they took chair side instantly without email? Well this dream is now a reality. 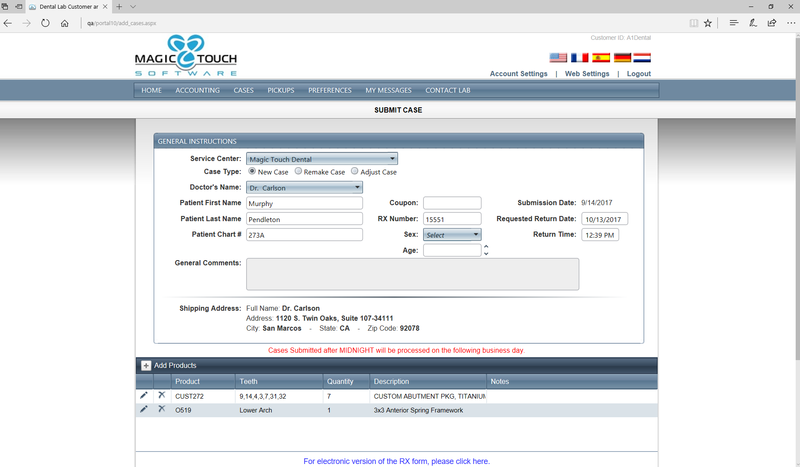 Magic Touch Software is proud to announce the ground-breaking DLCPM Customer Web Access Portal. This revolutionary new software introduces the ability to allow your doctors to communicate directly with your lab 24 hours a day / 7 days a week via the internet. Just imagine having a website dedicated to your doctors that can offer up to the minute case status as well as case submission, image and file uploads, case pick up requests, and accounting data including balance and payment information. Once installed, our experts will work hard to configure the application to meet your laboratory’s requirements. Your doctors will simply need an internet connection and follow the easy instructions for setting up their own personal online account. One example is with just a few clicks your doctors are able to submit a case online, instantly providing your laboratory with patient information, shade, requested ship date, case type, product, quantity, tooth’s, and any extra notes they feel are important to the case. At the same time, your doctors can upload pictures they may have taken chair side or a document of preferences or any other digital file they wish. Once the doctor clicks submit, this case information as well as the attached images are then entered in your database automatically where your lab can then bring up the case and add further production information or just begin work on the case. Just as easily as your doctors can log in and check the status of a case, they can also submit a credit card or check payment, and even request a pick up from your lab without ever picking up the phone. Your doctors will also have access to their current accounting information including statement dates, current 30, 60, and 90 day balances as well as the ability to send a message directly to a specific department. Picture how your doctors will feel knowing their lab offers this kind of security and support 24 hours a day that only DLCPM Web Services can provide. Specify Doctor Alerts via Email or Text Message (SMS) for certain Case Related Events as it moves through the various stages of production. Manage their own Customer Preferences regarding how certain products should be fabricated. Leave General Instructions for the lab regarding all cases. Submit Case Online – specify Patient Name, Shade, Products, and other pertinent information. View Case – search cases by patient first name or last name, date in or date invoiced, open or invoiced or all, sort cases by caseid, pan number, patient name, date in, ship date, date invoiced, total charge, and tracking number. Submit Case Attachments, including pictures, documents, and other electronic files. Send message directly to the laboratory. Order and Request Fulfillment Supplies.